Product #20730 | SKU EON610 | 0.0 (no ratings yet) Thanks for your rating! 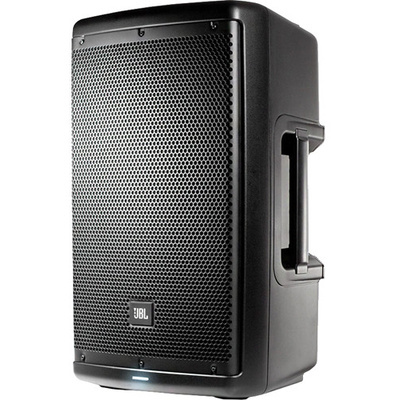 The JBL EON610 is a two-way 1000 W peak class D amplifier driven live sound reinforcement speaker that combines a wave-guided high frequency driver with a 10"(25.4 cm) woofer in a bass reflex cabinet. The speaker was designed from the ground up by JBL engineers to leverage the latest advancements in cabinet materials, acoustic science, transducer design, and integrated Bluetooth controllable DSP. The combination of the 300 W peak powered wave-guided high frequency transducer and the 700 W peak powered 10"(25.4 cm) woofer with bass reflex ports delivers a frequency range of 52 to 20,000 Hz at -10 dB and a frequency response of 60 to 20,0000 Hz at +3 dB over a 110° x 60° coverage pattern with a Max SPL output of 124 dB for a wide range of applications. The coverage pattern of the Image Control Waveguide is designed to match the high frequencies, crossover point, and low frequencies to deliver a more consistent on-axis and off-axis response. This allows the speaker to sound the same to members of the audience throughout the coverage pattern. Inputs are provided on dual combination mic or line 1/4" and XLR input connectors with individual signal gain knobs and a master volume knob for the overall level. An XLR loop-through allows you to route the signal to additional EON600 series speakers. To enable fine tuning of the speaker in different acoustic environments, the speaker includes a built in DSP processor with Bluetooth v.4 control through an iOS or Android app (available Nov 1, 2014). The app provides wireless control over the speaker's 5 band parametric AEQ, saving and recalling presets, and adjusting the master volume. Five push buttons on the back of the speaker allow you to physically switch between four different modes: Main, Monitor, Speech, and Sub for when incorporating a dedicated subwoofer. Additional controls include a button for engaging the built-in AEQ, disabling the speaker's front LED indicator light, and configuring Bluetooth control. The speaker is designed to work in a variety of configurations including on its side as a floor monitor, vertically as a floor monitor, suspended from above, placed on a tripod stand, placed on a pole mount on top of a subwoofer, or stacked on top of one another using their moulded index feet.